Mousesports participated at ROG MASTERS 2017 EMEA Finals as a directly invited team. They defeated ALTERNATE aTTaX 2 to 0 on Cobblestone and Train, and then clashed against Vega Squadron. After three long fights, mousesports claimed a spot to ROG Masters 2017. The $250,000 tournament will take place at Kuala Lumpur Convention Center, in Malaysia from December 7th to 10th. The battleground for the first battle was Mirage, selected by Vega. They won the pistol round as Terrorists, and maintained the lead until mouz bought. Two successive defuses brought extra gold in mouz’s hands, but it wasn’t enough, and the first half ended up being heavily contested. In the second mousesports had a good start, but Vega proved to have a better defense, and acquired the first victory of the Bo3 scoring 16:13. 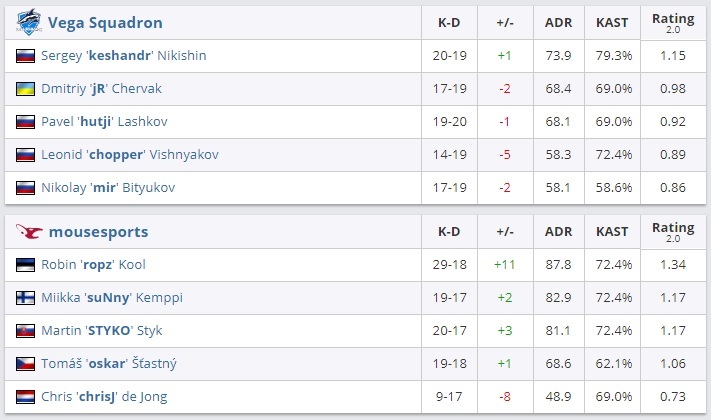 Vega had another optimal start on the T-side also on Nuke, but this time they didn't maintain the lead for long. Mouz won the 4th round, and the successive ones, ending the first half 10:5. Both teams fought with all their might on the second half, equally distributing the rounds, but mouz advantage granted them the final victory 16 to 10. All members of Mouz had a rating above 1.0, and three of them passed 1.3, which proves how much everyone contributed to the battle. The final conflict took place on Inferno. Robin “ropz” Kool was the best killer of the match, claiming 29 lives on his own. Both teams displayed a better game as Counter-Terrorists, but ultimately mouz had the upper hand 16 to 13. Their comeback as Terrorists, during the first half, gave them enough rounds to secure the map. Vega Squadron won the 2017 edition of China Top. They brought home a $45,000 prize after defeating ViCi Gaming 2 to 0 in the grand final.